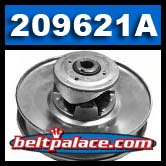 Home > COMET INDUSTRIES BELTS > COMET INDUSTRIES 203786-A/DF CVT BELT > Comet 209621A. Comet Industries 44D Series Driven Pulley. THREADED Post & Cam. Comet 209621A. Comet Industries 44D Series Driven Pulley. 8-1/2" diameter, 3/4" Bore, THREADED Post & Cam. Fully assembled with Comet Industries "RED" Cam Spring 203130A and Comet 3 Button Kit Comet 206458A. 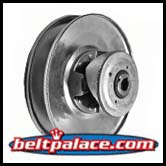 209621A Comet Industries 44-D Series Driven (Lower) Pulley. Cub Cadet (Grizzly) Part CV-207047. Comet 44 Series Driven: 8-1/2" diameter, 3/4" Bore, and THREADED Post and Cam. Pair with Comet 40 Series Drive units (Comet 203015A, Comet 203016A). 7/8" Top Width Belt. Use ONLY with Comet Industries Symmetric 7/8" Wide torque converter belts.